William Morris Davis wrote to Cyrus K. Holliday in Topeka, Kansas Territory, although Holliday was speaking in Pennsylvania in support of Republican presidential candidate John C. Fremont. Davis praised Holliday's efforts, for he saw both Fremont's election to the presidency and the free statehood of Kansas as steps toward the end of slavery. Millard Filmore, Know-Nothing candidate, had hopeless prospects, and Democrat James Buchanan would be rejected by the masses protesting the current administration, Davis claimed. 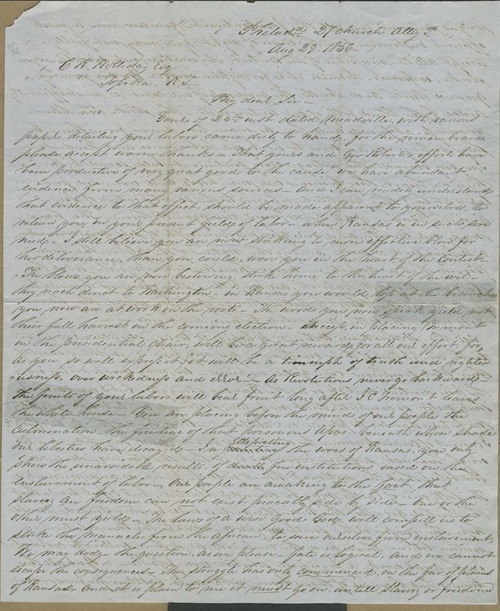 This letter uses exalted, militant, and religious language to describe territorial and national conflict. Davis also mentioned William Y. Robers (lieutenant governor under the Topeka Constitution), Burlingame, and Cobb.